Hopefully you’ve been able to take some time off this summer for a much-needed vacation or at least a little break from your busy schedule. I just returned from Caddo Lake in Texas, where ICR’s DVD production team filmed some incredible scenes for our upcoming dinosaur series. (We’ll share more in the upcoming months—you can look for details in the fall.) While it wasn’t a vacation, it provided a nice change of pace from my normal work routine. One day, the film crew piled into boats early in the morning and spent much of the day chasing down the perfect shot with just the right lighting on the beautiful water lilies, ethereal Spanish moss, and majestic cypress trees. Near the end of the day as the director called it a wrap, huge, dark clouds rolled in. 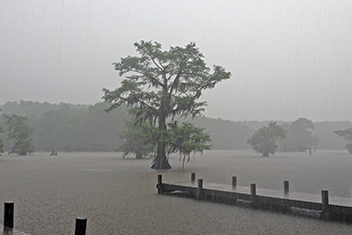 We made it to the dock as raindrops began to pound the wooden planks. Most of our group hurried off to their rooms, but I stayed behind, watching the storm, mesmerized by the rhythm of the rain on the boathouse roof and the swaying of the trees that dotted the lake. As I looked across the lake, my eyes zeroed in on a lone cypress tree in the middle of the water. In this issue of Acts & Facts, we’re reminded that Jesus Himself believed and taught a recent creation (pages 5-7). We also take a journey into the realm of the smallest things in the universe in the first in a series on subatomic particles—God’s building blocks (pages 10-13). These amazing particles not only demonstrate the intricate genius of our Creator but also provide a demonstration of His faithfulness in “upholding all things by the word of His power” (Hebrews 1:3). The very tree that Isaiah talked about so many years ago continues to remind us of the faithfulness of God. Slow down long enough to enjoy His presence and the things He whispers to you in quiet moments. Remember that He stands beside you every moment of every day—He’s always there to turn to and is interested in every detail of your life. God is never in a rush. Take time to marvel over His creation and His words this summer. Morris, H. M. 2012. The Henry Morris Study Bible. Green Forest, AR: Master Books, 1075. Cite this article: Jayme Durant. 2016. The Mighty Cypress. Acts & Facts. 45 (7).